On the Simple Body eating plan that we were on in the fall, dinners consist of protein and veggies. It’s actually a super healthy way of eating and now I prefer to eat that way, of course incorporating some veggies now that were restricted on the diet (carrots were not allowed). When planning our Christmas dinner menu, the kids wanted lamb and I wanted veggies, so I went on the hunt for a carrot dish. But, I didn’t want a side dish laden with sauces and that required me to be in the kitchen prepping for a long time and incorporated unnecessary calories! I found this recipe on Epicurious (click here), but added my own touches…. Preheat oven to 500°F with rack in lower third. Toss carrots with oil, cumin seeds, crushed chillies, salt, and teaspoon pepper and spread out on a large cookie sheet on parchment paper. Roast 20 minutes. 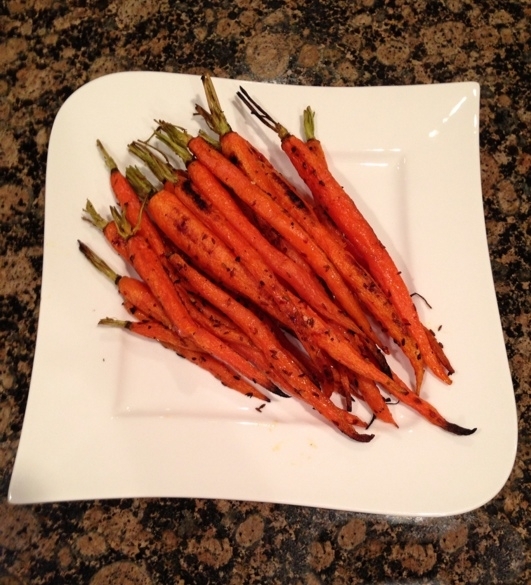 Reduce oven to 325°F and roast, stirring occasionally, until carrots are browned and tender, about 25 minutes more (watch the time….larger carrots will require the full time, smaller will require less). If you don’t like spicy foods, you can limit or totally omit the crushed chillies. We enjoyed these SO much on Christmas Day that I made them to go with barbecued chicken when we were in Hawaii. They only take a handful of ingredients, so they are easy to make when you’re away! Delish…and good for you! And to boot, they look quite appealing plated on a white platter!